Internationally renowned composer/music director Renée Baker premieres a new score for the Black cast aviation drama starring Harlem actor Lawrence Criner. World War I ace fighter pilot Captain Billy Stokes (Criner), newly returned from the war, resumes his job as a railroad detective and must once again prove his worth by solving the mystery of a missing payroll agent and in the process save his sweetheart Ruth’s life during a fiery air battle. 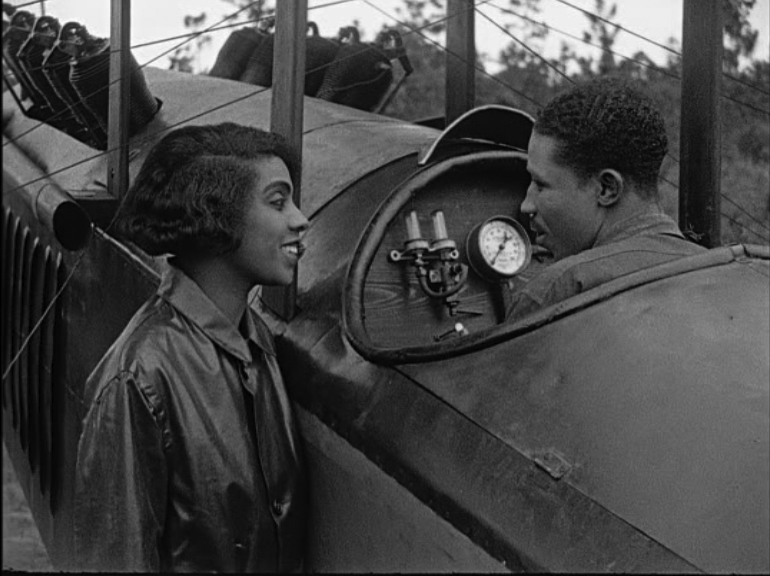 Inspired by the famed African American aviator Bessie Coleman, The Flying Ace also features Criner’s wife Kathryn Boyd as Ruth. Renée Baker is founding music director and conductor of the internationally acclaimed Chicago Modern Orchestra Project (CMOP), a polystylistic orchestral organization that grew from the plums of classical music as well as jazz. Baker is a member of the world-renowned Association for the Advancement of Creative Musicians (AACM). She has composed scores for Oscar Micheaux’s Body and Soul, as well as A Page of Madness, The Golem, and many other films. She has composed over two thousand works for ensembles ranging from pieces for solo instruments, ballet, and opera to large orchestral works that bridge the classical, jazz, and creative music genres. An expert at ensemble development and training, Renée developed the Mantra Blue Free Orchestra (Chicago), PEK’ Contemporary Project (Berlin), the progenitor of Bleueblue Walkers/Bass Kollektief, Twilight Struggles (Berlin), and helped create more than 20 cutting-edge new music ensembles.